I am embarrassed to say that I even read this book! It certainly was not one I would ever buy or even put on hold for that matter. I was at the library last Sunday, and I already had a pile of books on Iran (going there this summer), Farsi language CDs, a book on the Appalachian trail, numerous Iranian films, and a book about introverts in church. This book was on display at the end of one of the library shelves, and I threw it in the pile. Since I have worked with women who have come out of abusive relationships, I wanted to get inside this woman's head. This franchise has always intrigued me. So, I thought an inside perspective would help me understand why anyone would want to do a show like that. This book is part of the Renovaré Institute curriculum. So I thought I would read/listen to it before the school started. This is a compilation of articles and talks that Dallas Willard gave over many years about Jesus' final commandment to "make disciples of all the nations." I liked it! 1. Ambition - the choice to be, have, do, or experience something greater in our lives. By deeply contemplating higher aims, we energize ourselves to pursue them. 2. Expectancy - a choice to believe that our dreams are possible and that we can achieve them. Desire without belief in self is ultimately deflating. 3. Focus (Attention) - Giving our ambitions consistent mental attention keeps the drive alive, our energies swirling win anticipation. Don't let the distractions of the day steal mental focus. Real downfall: distraction. We mustn't let our dreams die in the daylight because we lose focus while responding to the world's lame interests or false emergencies. We mustn't take our eyes off of our goal. This is the Clifton StrengthsFinder for churches. It was helpful, but I hear the regular Clifton StrengthsFinder book gives you test results that are more detailed. It is short and sweet and gets inside the head of someone who escapes in his thoughts. I am not one to do that, but I hear other people are, and it fascinates me! Interesting story. I downloaded this in April as a Free Book of the Month from Christianaudio.com. (Great company, by the way, and they have their big half-yearly sale going on right now with 7.49 for most books. I am not paid to say that either!) I am waiting for some audiobook holds from the library, and it is a short book. I think I read this in college. I am not a big apologetics person, but I love how this book is chock-full of Scripture. Lloyd James is a very pleasant narrator too. This will give you the basics of Christianity. The nurse during my acupuncture appointment said she has the whole set of his books, but she has never read them. I think I inspired her! This is my third time reading through this book as I discuss it with a woman I have been meeting with for several years. I really love it, and reading through it this time, I realize how much of the principles in the book are so deeply ingrained in me that I forgot that I learned them from this book. I think I read it back in the 90s. It is probably my favorite book on leadership development. I use his "time lines" when I take people through the SHAPE process (Spiritual Gifts, Heart Passions, Abilities, Personality, and Experiences), as it is very helpful for people to see patterns and life stages of their own development. I highly recommend this book. I had never read anything by an African author so this was very educational. I found it was very slow in parts, but I think that was because of the narrator more than anything else. So, I put it up to 1.25 speed, and it went much better for me! I thought it was much more interesting once I got to the part about the missionaries coming and being super culturally insensitive to the people and their customs and way of life. When Western imperialism was added, it became a very interesting conclusion to the story because things fell apart! This is usually on lists of classic books to read. So I am glad that I read it for with my Book Dames group. I will add more once we discuss it in mid-July. Words cannot expressed how much I loved this book. The writing is very engaging, and it is hard to believe that this book is the first novel by this author. This story is about a woman in the modern day, and her great-great grandmother in the early 1900's. It is about women, and the things they go through in this patriarchal culture. I have dear friends from Afghanistan. I hope they can read, and we can discuss it! I am so surprised that librarything.com predicted with "high confidence" that I probably would not like this book. This could not be farther than the truth. This is an absolutely dear book. I loved it. It makes you laugh out loud and cry. I love his evolution. You learn why he is the way he is, and you learn about love. Beautiful story in every way. I highly recommend it. The narrator on this version is also excellent. This is an eye-opening and informative book, important for Americans to read. We need to rethink incarceration in this country. He brought out some key points about the disproportionate number of black people in prison, being put there without proper legal representation. This book was hard to get through because some of the stories made me, literally, sick to my stomach! The only criticism about this book would be that he sometimes ventures too far into the legal minutiae of many court cases, but it is a great book, and I stayed up late to finish it. It makes me want to do something about this terrible problem we have in this country. But what? How? 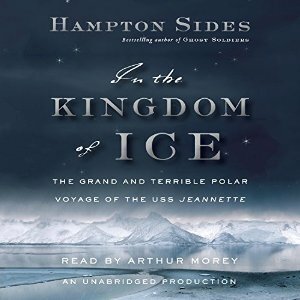 I was a bit confused listening to this audiobook at first, but once the actual story commenced it was much more interesting. What a doomed mission! It hurt my heart to see them go off into the Polar unknown based on misinformation. It is hard to believe there was a time when you could not communicate with the developed world when you would go off on an expedition. The last hour of the book was excruciating painful to listen to. Many of the men survived as they were separated into three separate parties. One of the parties, including the captain, did not survive. It was so sad, but it was very interesting. Life has been so full that I have not even had time to do a freewrite. I looked at my calendar today, and after a totally packed Wednesday, I had all day free. Hopefully, I will not fritter it away. But I have been up since about 4:30, and I have not done the best job at focusing. So, I am focusing by writing out my thoughts. Nothing particular is on my mind. I had a hard beginning of last week, but I chose to "rejoice and be glad" as Psalm 96 directs. It was a choice. I took pictures of beautiful things and looked for Your goodness everywhere. Then I got to work and Dee said, "I am not using my classroom today if you want to use it." And I DID! I "had a ball" in my Pilates I class instead of having to drag all the balls across the gym. Many other things happened that day that showed me that I didn't need to be down in the dumps.